Albanian opposition held a four hour protest on Saturday evening in the capital Tirana; a protest which was filled with tension and violence. Addressing his party faithful, who accompanied him at the party’s headquarters, opposition leader, Lulzim Basha said that “you have sealed Edi Rama’s departure as a non-negotiable condition for a transit government, which will organize free and fair elections”. The tense atmosphere which was initially noticed in front of the government’s building, was also repeated when demonstrators marched in front of parliament. Police fired teargas to disperse the crowds who were trying to break through police cordon. This situation was repeated several times, while demonstrators remained in front of parliament along with opposition leaders. 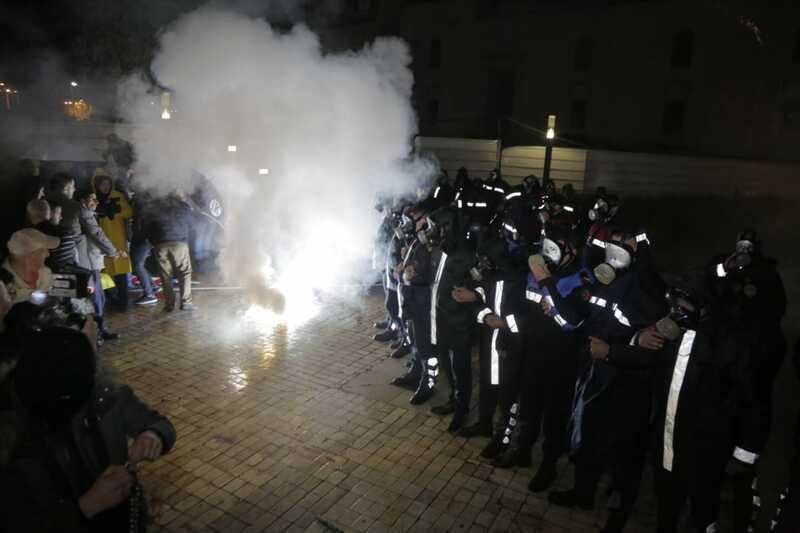 Parliament’s building was constantly attacked by Molotov bombs, smoke bombs and firecrackers. The country’s president, Ilir Meta called for confrontations to be avoided. In a message on Twitter, Interior minister Sander Lleshaj condemned the opposition’s acts. “Today, this blind violence is attacking constitutional institutions and State Police. The injury of police officers is a shame and those responsible for it will be held accountable”, Mr. Lleshaj said. On his part, PM Edi Rama also posted a message on Twitter where he expressed his “solidarity with every police officer who, in a day like this, must face the acts of a desperate political class! I feel sorry about those wounded police officers who were attacked by two parties that are marching towards self-destruction”, the PM wrote on Twitter. This was the ninth opposition protest since February and the third in front of the government’s building. The opposition has also relinquished its parliamentary mandates in a bid to put more pressure on the government. But, this decision has been openly condemned by the international community.